This Carvalho situation is what I have been saying has been going on (in my opinion) for the last 4 windows with various "targets." It's been laughed out of town by many. It certainly puts pay to the board supporters claims that the reason we dont spend big is because no player worth the money will sign. That **** Sullivan has played the very same trick he did with Bacca, only this time hes been rumbled. A case of crying wolf. I take it,next season's friendly in the Betway cup, won't be against Sporting Lisbon then. So does anyone know what could be the foreseeable future for Sullivan then after this fiasco. Yes Carnage and some gullible Kumbers on here have fuelled the fire. Go back and look at the old threads, Laca this, Bata that, Bacca this and now Big Willy. None were ever going to come to our club. One at the Arse, one at Chelski and gawd knows where Bacca is. I know where Big Willy ain't but just watch 'em on here when January approaches. We are small time and were never going to top that ridiculous fee we paid to Stoke for Arnie. And another thing, Huddersfield are just gonna love it tomorrow week!!! Coat gotten. Rasp wrote: So does anyone know what could be the foreseeable future for Sullivan then after this fiasco. I see a small man , possibly a Russian , he's wearing a Russian hat and jacket , Mongoloid features and he's being led up some steps , wooden steps , a carpenter is there , building and hammering , through the mist I can see more , there's a man with a hood over his face and a great big bloody axe in his hand , there's a gallows too , and a small wooden table with a set of sharp knives placed on it , oh , there's a set of ropes and two cart horses too , Suffolk Punch I think , now the little Russian man is screaming '' She made me do it , she made me do it !!!! ' - now I see claret and blue shirts , faces laughing ......they're singing or chanting , I'm not sure which , the Russian man's neck is being put in the noose and they're hanging him , but not enough to kill him , down he comes ....the horses are being made ready , they're pulling ropes in opposite directions , more screaming and some cracking noises , the small man is now being put on the table , I hear a man with a Cockney accent , ' Confess , David , confess and we will show mercy ' - ' No mercy ' the crowd are shouting ' No mercy , he killed our club !! ' - Out come the knives , his chest is cut open , they're looking for his heart , but he doesn't appear to have one ......the man with the axe is smiling..
Last edited by The Old Man of Storr on Sun Sep 03, 2017 10:18 am, edited 1 time in total. Brilliant. Best bit of fan fiction I've ever read. All this Carvalho stuff ended well for me. I cringe when I see repeated reference to Little Pea. A few years of Big Willy would have been unbearable. 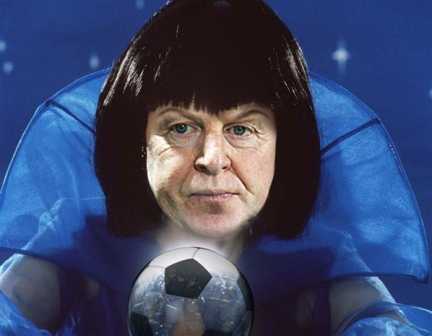 I tried inserting a photo of Mystic Meg but not for the first time my technical skills let me down .
' Fan Fiction ' is rather appropriate - cheers , Pinks . The Old Man of Storr wrote: I tried inserting a photo of Mystic Meg but not for the first time my technical skills let me down . And on that note, yet another transfer thread joins our archive.